A breakthrough in technology could see the memory capacity of devices such as the iPod increase by 150,000 times, Glasgow University researchers claimed. Two experts said they had developed a molecule-sized switch which means that data storage could be boosted without having to increase the size of devices. 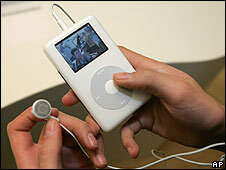 The biggest MP3 player currently available can hold about 40,000 songs. However, new nanotechnology could theoretically allow users to store millions of video and music tracks. Professor Lee Cronin and Dr Malcolm Kadodwala, from the university's chemistry department, said their work could see 500,000 gigabytes squeezed into a microchip no bigger than a two pence piece. They increased the storage capacity without enlarging the size of the device by developing a new molecule sized switch. The microscopic switch - made up of two clusters of molecules positioned just 0.32 nanometres apart - allows scientists to easily manipulate an electrical field. The nanotechnology experts said that by placing these switches on a gold or carbon surface, they could fit up to 1bn transistors - the fundamental building blocks of computers and electrical devices - on to a single chip. This is more than five times the current limit. The technology could also be used in other electrical devices, such as DVD players, to increase their memory and performance, the scientists claimed. Professor Cronin said: "What we have done is find a way to potentially increase the data storage capabilities in a radical way. "This is unprecedented and provides a route to produce new a molecule-based switch that can be easily manipulated using an electric field. "The fact these switches work on carbon means that they could be embedded in plastic chips so silicon is not needed and the system becomes much more flexible both physically and technologically." The work was undertaken with colleagues at Daresbury Laboratory in Warrington, using its giant X-ray machine (Synchrotron Radiation Source). 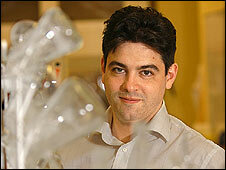 Details of the research are published in the journal Nature Nanotechnology.